These one of a kind, hand crafted, beautiful wreaths are made from bittersweet vines collected from conservation land. The berries have not been disturbed so they will not spread this invasive species further. (It is illegal in Massachusetts to sell bittersweet with berries.) I have permits to collect the vines I gather. This helps preserve and protect the native New England forests endangered by this invasive vine. I designed these wreaths to function as is, or to have seasonal decorative accents added so they reflect whatever mood, event or season you wish. For the winter holidays I add winter berries, festive bows, pears, and evergreens. During the spring season I add apple blossoms, and in summer pink and purple flowers look beautiful. 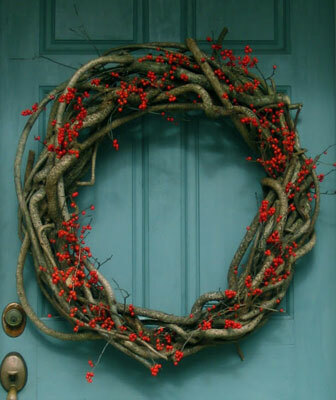 You can leave them on your door and simply swap out the decor as the season or event warrants. These wreaths should last many, many years. They are finished with two coats of marine spar varnish to protect them from the elements.